It would be hard not to be affected by the devastation of the earthquake in Haiti. Companies and individuals everywhere are helping in whatever way they can and Stampin' Up! is no exception. In the past SU! 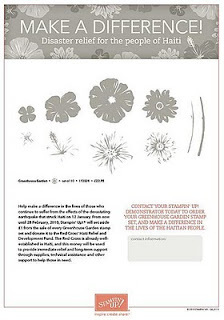 have made donations through designated stamp sets and from now until 28th February Stampin' Up! will donate £1 from the sale of every Greenhouse Gardens stamp set and donate that money to the Red Cross. This will be a worldwide effort, with demonstrators in the USA, Australia, Germany and France all having a similar offer. You can see example cards made using this stamp set on page 43 of the catalogue. If you'd like to order either a catalogue or the stamp set, then please contact me. I will also be donating £2 for every Greenhouse Garden set sold to the Red Cross. If you want to find out how the Stampin' Up! headquarters are helping the relief effort for Haiti, please read Shelli's blog.